Our society typically doesn’t value strength training the way is should and it definitely doesn’t value strength training in childhood. For many Americans strength training is something for athletes and body builders. In reality we all need to have strength training is important because our bodies require muscles, not just for movement, but also to support our frame. Additionally bone health is tied to muscular strength, strong and active muscles put tension on their attachment points on our skeleton which stimulates bone tissue to build and maintain it’s strength. Therefore low bone mineral density leading to osteoporosis can be directly tied to muscular weakness and a lack of proper strength. The earlier in life we start strength training, the more muscular and bone strength we gain by age 25 which is the point at which it starts becoming more difficult to train. Now I come to the part of this article that sounds crazy or maybe not if you have been paying attention, strength training in childhood. A recent study published in the journal Bone (yup, its a real peer-review journal) found that children who have a gain in lean muscle mass from birth to age 6-7 have higher bone mineral density than those with a smaller gain in lean muscle mass over the same time period. This means that stronger kids have stronger bones. The authors took 200 children; measured their bone mineral density, lean muscles mass, and fat mass at birth with advanced imaging studies and then did it again when these kids reached the age of 6-7 years old. Not only did they find a gain in lean muscle mass is related to increase in bone density they found that a gain in fat mass did not increase bone density. 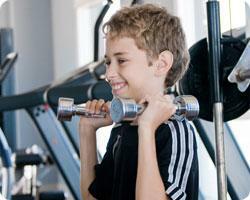 This helps to determine that it is muscle strength alone which influences bone health not weight gain in these kids. This study gives us greater authority to say that strength training is important to improve bone health, no matter what the age we are. This study also shows how important it is to start establishing good exercise habits early. We have our greatest potential to build muscle and bone strength up to age 25, after this age it not only becomes difficult be we start to loose 0.5%-1.0% of muscles mass per year. Children today still play outside and but can you honestly say they play outside as much as you did as a kid, how about compared to your parents when they were kids? The answer there is no, so they are not getting the same benefit of play, which is strength gain, to the degree that us and our parents did. Children need to strength train just as adults do, it is safe and it will benefit their health far greater than they will realize today. So do a little research, the internet is a great thing, or give us a call I can give you a few hints to what you should or could be doing.